I tend to go into detail in my entries about why I purchase the products I do purchase, but there are, obviously, a myriad of parrot products I do not purchase. There are, in fact, a lot more products that I won’t purchase than products I will, and I am very frequently asked what I think about certain products if I have yet to write about them on the blog. Why don’t I make these types of questions and answers public? It is not my intention at all to discredit or defame any vendor publicly, and I’m not trying to put anyone out of business; rather, I’m trying to do just the opposite: showcase those vendors who I think are creating top notch, unique, safe, and enriching products. I also know that many people do not quite share all of my same standards or paranoias about food, toys, or toy parts, so just because something isn’t right for Charles, Lola, or Sabrina doesn’t mean it won’t be right for somebody else’s flock. There are, however, a few things that I’m a big believer in: shopping bird-free, for example, is a big concern of mine, as is using stainless steel. Another concern of mine is using safe plastics, in particular with food-related products or foraging toys. I get this question extremely often, and I figured that it was worth addressing publicly, because safe plastics don’t fall under any one brand but rather are simply one of the many materials used in bird toys by almost every company. Whether or not you feel comfortable giving your birds plastic toys is very often an individual owner’s decision, and definitely requires knowing your bird. I know that Lola, for example, has way too strong a beak to be able to play with plastics safely, and she tends to harbor little pieces of plastic in her mouth for long periods of time. Thus, plastics are a complete NO for her, unless they are very large pieces of extremely hard plastic beads (like marbella beads) that she absolutely cannot chip or destroy. But generally, I simply say no plastic toys for her. On the other hand, both Charles and Sabrina can play with plastic beads in a completely safe way. They can beak and beat and batter them and never chip them even a little, so plastic beads are completely fine as toy parts for them. But there is a different consideration that I would argue should be ruled out for every bird owner, whether or not your parrot can play with plastics safely. This consideration is using unsafe plastics in food service applications. Unlike plastic beads or toy parts whose safety can vary depending on bird size, power, and style of play, using unsafe plastics in food service applications is dangerous for all birds, regardless of size, strength, or habits. As we all know, there are many, many different types of plastic, and I’m sure most of you are used to looking at the bottom of a plastic dish or tupperware to see if it is microwave safe or not. Well, this relates to safe and unsafe plastics. More recently, I’ll bet, you became aware of a substance called Bisphenol A, or BPA, in plastic water bottles or baby bottles. Nowadays, it’s pretty much impossible to sell a water bottle that contains BPA, because consumers have realized that BPA is a chemical that is present in many plastics, that leaches into water after repeated use and washing. Some countries have labeled it a toxic chemical, and scientific studies show links between BPA and hormone-like properties, cancer, thyroid problems, neurological problems, obesity, and other scary problems. Plastics that contain BPA, such as polycarbonate, should not be used in water bottles or food service applications, especially with hot food or water, as these leach the chemical at a more rapid rate. Most people purchasing new water bottles or baby bottles know this, but what about bird food and water dishes? If you use plastic dishes, have you checked to make sure that they are indeed BPA-free? Probably even more common are plastic foraging toys, which are hugely popular. But every time you put food in one of those cool plastic foraging toys, and especially the more you wash it, it breaks down the plastic and more and more BPA is leached out onto the food, which is then consumed by your bird. I’m well aware that many people will think to themselves, “Oh, but I’ve been using those for ages, and my birds are perfectly fine!” Well, many generations of human babies were also raised on bottles made with BPA, and obviously we don’t have an entire generation of people who passed away without explanation. But we do have studies that show that BPA can lower fertility rates and cause neurological problems in children, among other negative effects. It can even manipulate hormones and cause issues with reproductive behaviors. Your bird won’t drop dead from BPA, but he or she might be extra hormonal, or suffer neurological consequences. The good news is, there are safe alternatives! One of the safest plastics for use with food is acrylic. But don’t be fooled: polycarbonate and acrylic are two very different plastics, even though they look virtually the same. 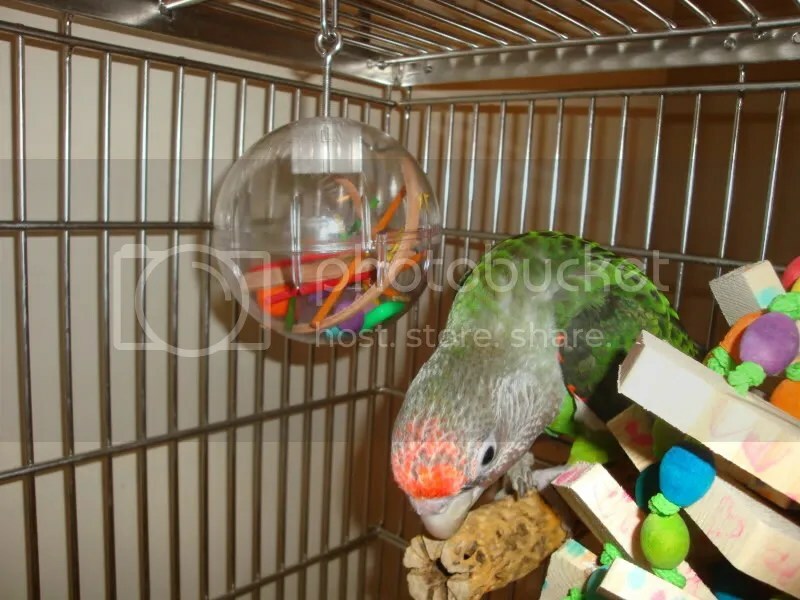 In fact, I’ve seen many bird toy websites that mislabel toys as acrylic when they are actually polycarbonate. Polycarbonate is a huge source of BPA, whereas acrylic is completely BPA-free. MOST foraging toys on market are actually made of polycarbonate, but there are a select few that are made from acrylic. Don’t necessarily go by what it says on any website: if you are unsure, call the company and ask if their toys are made from polycarbonate or acrylic. There is a vast difference. This toy, for example, is a set of acrylic foraging drawers. I am sure you have seen many polycarbonate models on the market, but this is the only acrylic version that I’ve been able to find. It is made in house at Parrot Island Inc. and is a great toy that I highly recommend. They actually make many different setups as well: two drawers, four drawers, six drawers, drawers that pull out front to back, drawers that pull out side to side, etc. These toys are more expensive than the more common polycarbonate versions because acrylic is a higher quality plastic, plus these are made at a much lower volume. But, they are worth every penny in terms of safety. Here’s another acrylic foraging toy that exists on the market, this one by Grey Feather Toys. It comes in two sizes, 2.5″ or 4.5″, the larger 4.5″ model shown above next to Lola. I feel completely safe using these acrylic foraging toys: not only is it extremely strong like polycarbonate, but it is far safer and contains absolutely no BPA that will leach into your parrots’ food or water. Although there is much more to say about safe plastics in general or other unsafe plastics (don’t even get me started on soft vinyl), this is one of the most important issues with plastics that I have, and I hope that I can spread awareness about BPA in plastics. There are so many great alternatives out there now that there is no reason to use plastics that contain BPA in food or water bowls or foraging toys. Thanks for another great post! Question for you regarding the washers you use for toy and perch attachments on the cages. Are those acrylic as well? Where can I find them? Great – thank you! 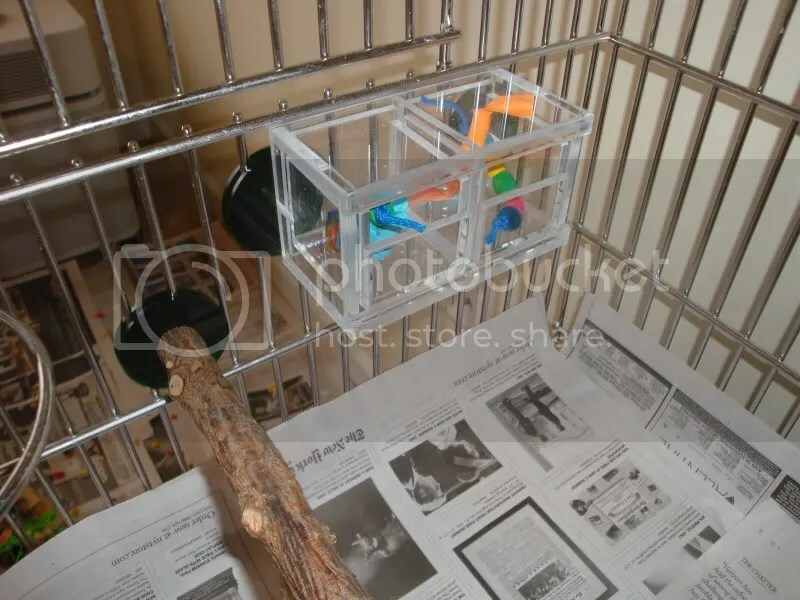 I have an EH SS cage being made for my Pionus, Cali – we can’t wait to decorate! In my studies as a naval architect, I’ve spent a year studying polymers ( I find the term “plastic” very limiting and scientifically untrue). I can’t speak of parrot toys, because I do not know what a certain brand is using in its polymer structure, it would be interesting, though, to see what their toys are really made of. Ah, yes, great point — I am aware of how much of an “umbrella term” and sometimes misnomer the term “plastics” can be, but I figured for these purposes I’d just keep it simple and basic. To be honest, I have bought a ton of those popular polymer foraging toys and I think I’ve gave them once…twice, maybe. It’s nothing against the material as it’s my view on what a foraging toy should look like. Once they figure out how to turn something or open it, there’s no more challenge. I like as natural and as chewy toys as possible and they seem to prefer it that way, too. oh i LOVED that drawer toy!! I have never seen it before, quote expensive BUT Big Bird’s birthday is coming up mid february…. 🙂 thanks for all the links to the things you mention. very very helpful! You are currently reading Using Safe Plastics with Food at Coco's Flock.